Whether used in the kitchen or for showcasing soup on food carts, buffets, or other self-serve stations, the Vollrath 720202002 Full Size Soup Merchandiser Base with 7 Qt. Accessory Pack and Tuscan Graphics is an excellent addition to your food service facility. This product is easy to operate and equipped with a lighted on/off switch and recessed controls to make it easy for employees to adjust the temperature while preventing guests from accidentally changing the setting. Thanks to its low-water indicator light, this item efficiently notifies whenever the water is close to running out so your staff can refill it accordingly. This catering essential is easily visible thanks to its attractive Tuscan graphics. 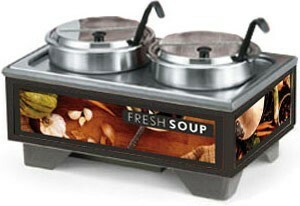 Ideal for high volume settings, this soup merchandiser base comes with one 7 Qt. adapter plate, two 7 Qt. insets, two hinged covers, and two 3 oz. Kool Touch stainless steel ladles.